A brilliant center stone floats atop a 6-prong crown, finished with intricate milgrain detailing, in this stunning vintage inspired design from the Hera Bridal Collection. Diamond Info: 06-RD 0.05 CTS Fits center stone size RD: 6.0 - 7.0 MM GUIDE Center stone not included. 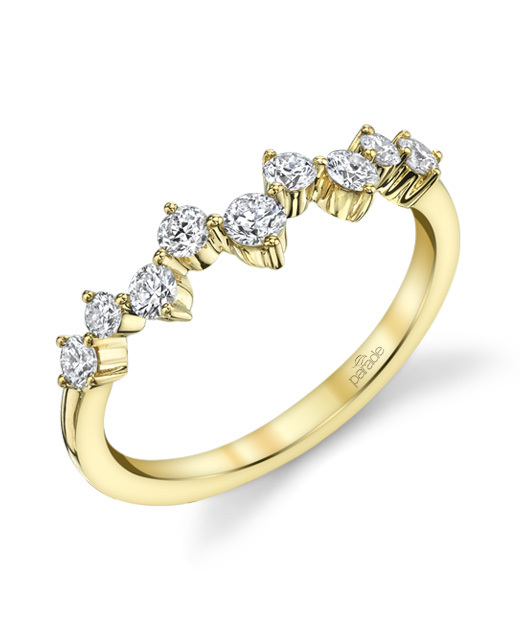 Brilliant diamonds float amid openwork scrolls of gold, showcasing a gleaming center stone. Diamond Info: 06-RD 0.13 CTS Fits center stone size RD: 7.0 - 7.5 MM GUIDE Center stone not included. From the Lumiere Bridal Collection, pear shaped rose cut diamonds glow in gleaming 18K gold suspended from a fine link chain. Diamond Info: 04-RCPD 0.35 CTS Length: 18 inches, adjustable.